"Horoscope Analysis - Heart disease", "Learn Astrology- Theory", "Learn Astrology- Application", "Learn Astrology- Predictive Techniques", "Learn Astrology - medical Astrology, Learn business astrology." "ANALYSIS OF HOROSCOPE FOR HEART DISEASE"
The medical astrology, which is a branch of astrology, is one of the various facets of the divine science of astrology for the benefit of the mankind and it is fully competent to answer our questions regarding health i.e. (1) to what type of diseases a native may be vulnerable to; (2) when; (3) whether it will respond to medical treatment; and (4) preventive measures. The analysis based on Systems’ Approach clearly indicates the status of health. The health is one of the various aspects of life and heart disease is a part thereof. The natal chart of a person can indicate whether a person is likely to have a heart disease and if so, at what age. For detailed study of the status of health, the readers may refer to my book, “MANAGE YOUR HEALTH THROUGH PREVENTIVE ASTRAL REMEDIES”. First of all we identify the planets. The lord of the ascendant and/or the lord of the sixth house containing a mooltrikona sign is/are the prime indicators of health. The lord of the fourth house is the secondary indicator so far as the heart disease is concerned. The planets, the Sun and the Moon are the primary and secondary significators for a heart disease, respectively. The Moon governs the blood and represents all functions in human body. Other contributory planets are Mars, ruling the muscular parts, and Jupiter, governing the arteries. If the prime indicators and/or the fourth house containing a mooltrikona sign are weak and the most effective points of the first, sixth and/or fourth houses are afflicted, the person would be vulnerable to a heart disease. Since the Moon and Mercury are weak quite often and, in case of Aries rising, the Moon becomes secondary indicator/significator for heart condition and Mercury becomes prime indicator of health, it makes Arians vulnerable to heart problems if Mars too is weak. Such natives would better use preventive astral remedies to take care. The close conjunction/aspect of the functional malefic planets with the weak prime indicator(s) of health and/or the primary or secondary significators for a heart disease will indicate the heart disease in the operational sub-periods of the functional malefic planets in the periods of weak prime indicator(s) and/or weak significators at an early stage of life. The indications of the timing are given also by the operating sub-periods of weak and afflicted prime indicators of health and/or weak and afflicted primary or secondary significators. The involvement of Mars as functional malefic planet, the lord of the sixth house ruling injuries and Ketu create the eventualities for operations and the absence of their involvement enables the native to respond to symptomatic treatment. The effect of the triple transit triggering influence of malefics is seen over the natal/transit weak indicators meticulously to forewarn the person. CHART 9: Male born 28th November, 1928, 2120 Hrs. The sign Cancer rises in the ascendant which means that besides Rahu and Ketu, Jupiter and Saturn become also functional malefic planets. Rahu, Ketu and Jupiter are close to the most effective point of the houses of their location and afflict all the houses occupied and aspected, including the most effective points of the first and fourth houses. One prime indicator of health and secondary significator for a heart disease, the Moon, is weak due to bad placement, infancy and the most effective point of its mooltrikona house being exactly afflicted by Ketu. The Moon becomes additionally weak for being closely afflicted by the most malefic planet, Saturn. The other prime indicator of health, Jupiter, is weak as its dispositor is weak. The secondary indicator, Venus, is weak as it is badly placed, its dispositor is weak. The significator of heart, the Sun, is weak as the most effective points of its mooltrikona house and house of placement are exactly afflicted by Jupiter and Rahu-Ketu axis, respectively. In view of the weakness of the first and fourth houses and exact afflictions to the most effective points of these houses, the native suffered from malfunctioning of heart for a number of years and in the sub-period of the lord of the sixth house and the main period of the lord of the eighth house underwent a by-pass surgery. 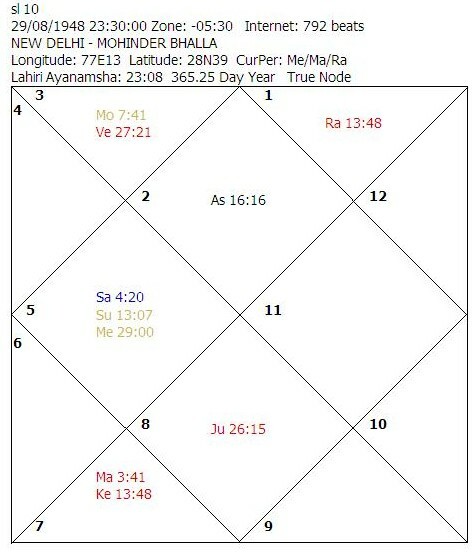 In this case, the exact aspect of Jupiter to the most effective point of the sixth house is a saving factor as it is the mooltrikona house of Jupiter. The sixth house rules diseases and the eighth house rules obstructions/death/death like sufferings. The native was suggested propitiatory remedial measures for the afflicting planets and strengthening measures for the weak planets. CHART 10: Male born 29th August, 1948, 2330 Hrs. The sign Taurus rises in the ascendant which means that besides Rahu and Ketu, Venus, Jupiter and Mars become also functional malefic planets. Mars is weak as it is badly placed, is in infancy and its dispositor is weak. 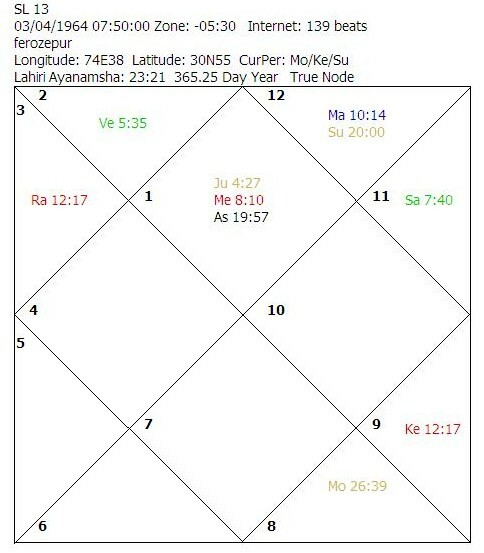 Mars is additionally weak as its mooltrikona house and house of placement are both closely afflicted by the Rahu-Ketu axis. Rahu and Ketu are close to the most effective point of the houses of their location and afflict all the houses occupied and aspected, including the most effective points of the fourth and sixth houses. The primary significator and secondary indicator, the Sun, is exactly afflicted by Rahu from the twelfth house. The Moon is weak as it lacks full luster i.e. it is less than 72 degrees away from the Sun. The Moon is additionally weak as the most effective point of its house of placement is closely afflicted by Ketu from the sixth house. Venus, ruling the sixth house and becoming the prime indicator, is weak as it is in old-age. 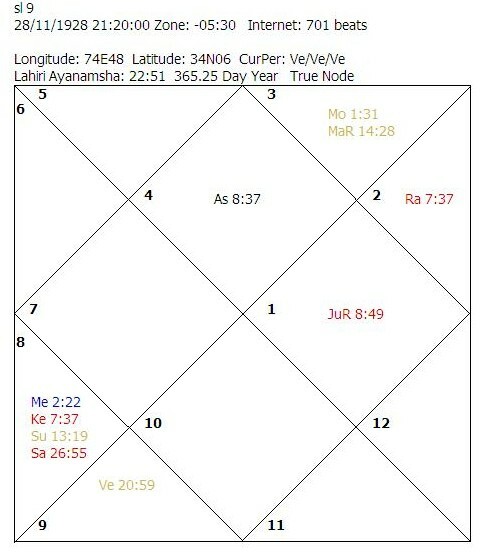 Venus is additionally weak as its mooltrikona house is closely afflicted by the Rahu-Ketu axis. Saturn, placed in the fourth house, is weak as it is combust, in infancy and its dispositor is weak. 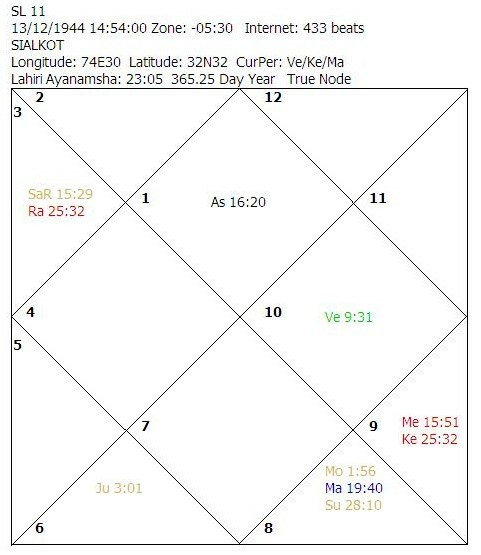 Saturn becomes additionally weak as the most effective points of its mooltrikona house and house of placement are closely afflicted by Ketu and Rahu, respectively, and both from malefic houses. Whenever a functional malefic planet afflicts another planet/house from a malefic house its impact is further aggravated. During the sub-period of Venus, ruling the afflicted sixth house, and in the main period of Saturn, the native suffered a massive heart attack and died within a few minutes. CHART 11: Male born 13th December, 1944, 1455 Hrs. The sign Aries rises in the ascendant which means that besides Rahu and Ketu, Mercury becomes also a functional malefic planet. Mars is weak as it is combust and badly placed. Mercury is weak as its dispositor is weak. Jupiter is weak as it is badly placed, in infancy and debilitated in navamsa. The Moon is weak as it is badly placed, debilitated, in infancy and lacks full luster. The Sun is weak as it is badly placed and in old-age. The prime indicators, Mars and Mercury; the secondary indicator, the Moon, and the significators the Sun and the Moon are all weak. During the main period of the functional malefic planet, Ketu, and the sub-period of the functional malefic planet, Mercury, the native suffered from heart problem and underwent open heart surgery in the beginning of the main period of Venus. CHART 12: Male born 10th August, 1947, 2256 Hrs. The sign Aries rises in the ascendant which means that besides Rahu and Ketu, Mercury becomes also a functional malefic planet. Mars and Mercury become prime indicators of health while the Moon becomes the secondary indicator for heart condition. Mars is slightly weak as it is in infancy. The Moon is weak as it is exactly afflicted by functional malefic planets, Rahu and Ketu. Mercury is weak as its dispositor is weak and it is afflicted by the exact aspect of Ketu from the eighth house. The Sun is weak as its dispositor is weak. Jupiter is weak as it is in old-age and its dispositor is weak. 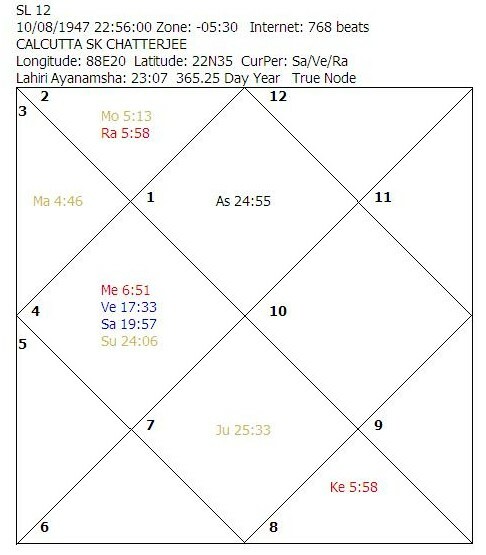 The close affliction to the lord of the fourth house and the lord of the sixth house in the fourth house resulted in a heart attack in the sub-period of Ketu in the main period of Jupiter. At the time of the heart problem, the natal Mars was under the close transit affliction of stationary Ketu and Rahu, but as the lord of the ascendant is not under severe affliction natally, the native responded to the symptomatic treatment. CHART 13: Male born 3rd April, 1964, 0750 Hrs. The sign Aries rises in the ascendant which means that besides Rahu and Ketu, Mercury becomes also a functional malefic planet. Mars and Mercury become prime indicators of health while the Moon becomes the secondary indicator for heart condition. Mercury is weak as its dispositor is weak. Mars is weak as it is combust and badly placed. Mercury becomes additionally weak by being closely afflicted by Ketu. The Sun, being primary significator of the heart, is weak as it is badly placed. The Moon, being secondary indicator and secondary significator of heart condition, is very weak as it is badly placed, debilitated and in old-age. The several weaknesses and afflictions make the native vulnerable to heart problems during transit afflictions in the sub-periods of indicator and significator planets. The native suffered from heart disease and had to undergo an open heart surgery at the young age of 27 years, in the sub-period of Mercury in the main period of Venus.